Walking down the garden path in a dream! 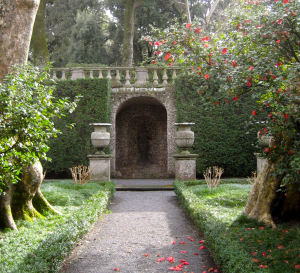 Italian Renaissance gardens were obsessed with Roman gardens. Arches, walls, statues, metaphor, allegory, symmetry, vistas. When we think of a ‘garden room’, we harkening back to Italian gardens, the root of early French and English gardens. The French went on to spread vistas and geometrically organized paths across acres, while Italian gardens were always more intimate. The English rebelled against geometric order and began to celebrate the informal and ‘natural’ part of the Italian garden – the bosco. To appreciate the Italian Renaissance garden is to revel in creative dichotomy – apparent opposites becoming richer when together – man-made and natural, historical and immediate, sheltered and open, conscious and unconscious, action and stillness, solitary and communal, commotion and quiet.